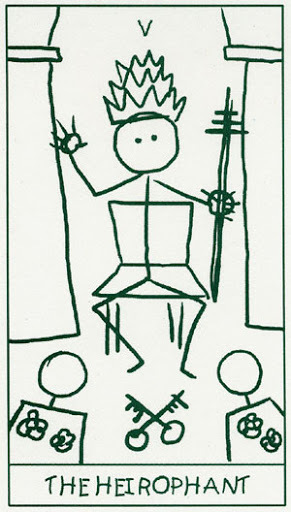 Rare and out-of-print, with a distribution run of slightly over 500, the stick figure tarot is a simplistic and humourous rendering of the Rider-Waite-Smith deck. This deck was self-published by a cartoonist named Lar deSouza in 1999. He spelled Hierophant wrong. There were two versions released: black and white (earlier) and green and white.